How Far is Ensure Builders Casa Grande? Inspiring neighborhoods are what we crave for, when taking decision to buy a home. A home where we live, thrive and be inspired. There are rate occasions where the mind and heart agree. If that is so, here is a gem of an opportunity where exciting neighborhood, modern architecture with all amenities, and built-in finesse of aesthetics and comfort and luxury with uncompromising quality come in unison. Glazed tiles for dadooing for all toilets 8'6" ht and above the Kitchen Watform 2'0 ht. Kitchen platform with 30 mm thick Black polish Granite top and ISI Marked standard Stainless Steel Sink. A/C plug point in Master Bedrooms. With adequate light, fan, geyser, exhaust fan and power paints. Power backup for lift and common areas are provided with aesthetically designed lighting fixtures and for individual flats 1KV for 2BHK and 1.5 KV power back Lip for 3BHK flats. CPVC anti fungal LIV treated Hot and Cold water Ptumbing system with Jaguar/Parry ware or equivalent CP fittings. Apartment sizes starting from 960 sft to 1654 sft. 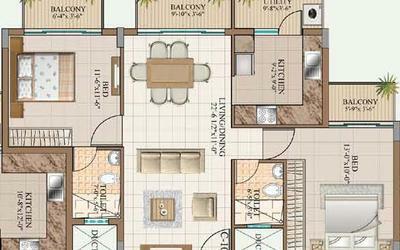 with 2, 2 + Study and 3 BHK options. Promoted by professional’s, with rich experience in development of several quality residential and commercial projects, catering to very discerning customer for more than a decade in Bangalore. We believe in building structures of next generation and that can only be achieved through the right mix of INNOVATION, foresight and action. Our corporate philosophy believes in learning and innovating new ideas to create a distinctive impact. From small but significant beginnings in 2000, Ensure has made rapid and conscientious strides, rising to India's top ten listed real estate developers and South Bangalore's preferred luxury home developer. Today, Ensure has achieved exceptional growth on account of its choice of strategic unmatched locations, its understanding of housing requirements of the aspirational generation and its speedy execution of projects using state-of the-art construction practises. Being present at such sought after south Bangalore locales as Napeansea road, Gamdevi, Prarthana Samaj, Tardeo and Lower Parel - Orbit has completed four projects with a total saleable area of 253,772 Sq Ft. Orbit also has twelve projects under development with approximately 1.84 million Sq. Ft. of saleable area, in addition to three residential projects and the upcoming gated community project in Mandwa.Orbit is also one of the top ten real estate developers listed in Bombay Stock Exchange (BSE) and National Stock Exchange (NSE).